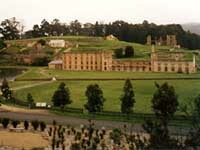 The second oldest city in Australia, Hobart is indeed a fascinating place to visit. Dating back to 1804 when it grew out of the penal settlement on the island, Hobart boasts many beautiful historical buildings and areas, all beneath the majestic backdrop of the often snow-capped Mount Wellington. There are many rewarding ways to spend your time in Hobart. Take a stroll along the riverfront and admire the Georgian and Victorian architecture, then visit Battery Point to see buildings made out of Hobart's golden sandstone, which gives parts of the city a warm, golden glow. On a Saturday, visit Salamanca Place where the sandstone warehouses date back to the 1830s and stalls line the maze of streets selling everything under the sun, while the surrounding art galleries, theatres and cafés will cater to your every entertainment need. Check out the Tasmanian Museum and Art Gallery to see the stuffed Tasmanian Devil and the extinct Tasmanian Tiger, or head to the Maritime Museum of Tasmania to learn about the whaling industry, see early Aboriginal boats and even shipwrecks. Hobart's wine industry has exploded in recent years and a day out in the Coal River Wine Region and D'Entrecasteaux Channel, sampling some of the region's wines and gourmet cuisine at Moorilla, one of Australia's most awarded vineyards, is not to be missed. Travellers should look into buying the See Tasmania Card which grants access to about 35 attractions across Tasmania, as well as tours and other discounts. Hobart is small and compact - easy to explore on foot or by bicycle. There is an efficient local bus service, the Metro, for which day passes are available. Ferries run between Franklin Wharf and tourist spots around the harbour.